After the gratifying – if unexpected! 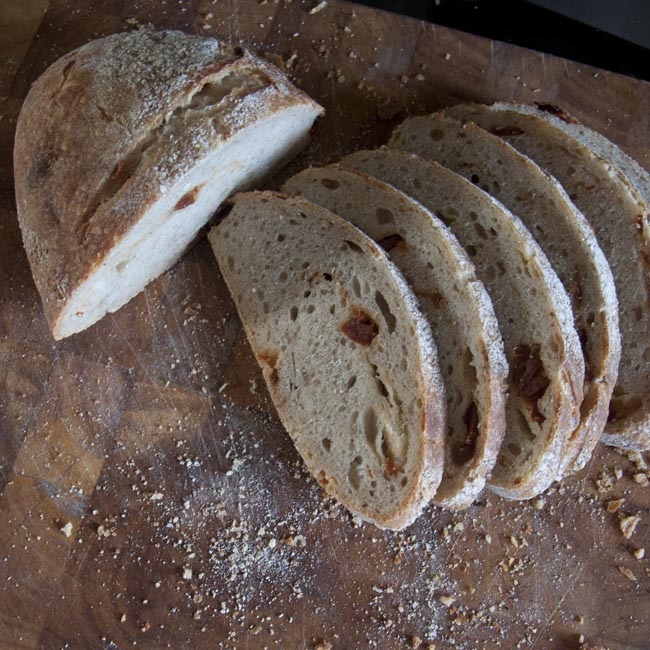 – success of my first sourdough loaf, I couldn’t wait to do it all again as soon as possible. The first loaf didn’t last very long, either, and certainly didn’t get a chance to go stale! So the next free day I had was dedicated to another baking day. I used broadly the same technique as for my first loaf (see ‘Sourdough Saga: Episode 3‘ for details) but with double quantities, and a downward adjustment to the salt content (10g in total in a two loaf batch). There were a couple of new things – first, the loaf shape. 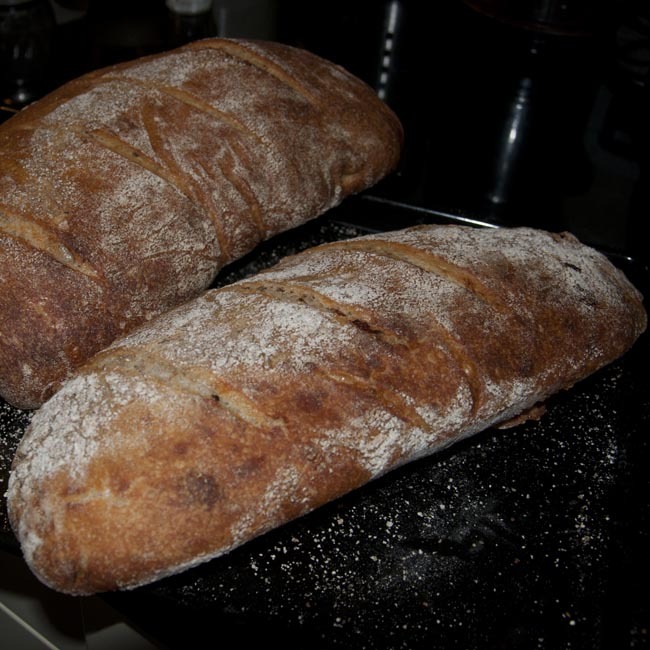 I wanted longer, narrower loaves, instead of the round I baked the first time. I’d love a full set of lovely baker’s bannetons, but they’re expensive and I’ve got nowhere to store them, so I improvised with a couple of long thin serving dishes I was given for Christmas last year by a friend, lined once again with a clean tea towel dusted generously with rye flour. It’s not quite the right shape, as you can see, and tilts up at the tips rather, but it allowed the final proving to produce a loaf of approximately the size and shape I was after. The ridge on the inside of the dish does leave an imprint on the loaf, but it’s all character! I had a generous handful of grated cheddar cheese and some sun-dried tomatoes left over from the previous day, so decided to make one of my loaves a cheese and tomato bread. I incorporated the extra ingredients during the final kneading, sprinkled across the surface when it was flattened out, and then folded into the dough during the shaping of the loaf. I think the cheese and tomato make a great addition to this sourdough. Something about the cheese flavour mutes the lactic sour note quite noticeably, making this a sourdough loaf that might go down better with people who aren’t that keen on the distinctive ‘sourdough’ flavour. The chopped sun dried tomatoes add a lovely sweet herby note (they were stored in herb oil). Texture-wise this loaf seemed to prove slightly less well than it’s unmodified brother, with a slightly denser texture and smaller holes. I’m not sure if this is the result of the extra oil / fats incorporated with the additions, or whether it has more to do with the difficulty I had keeping my oven up to temperature when baking two loaves together. 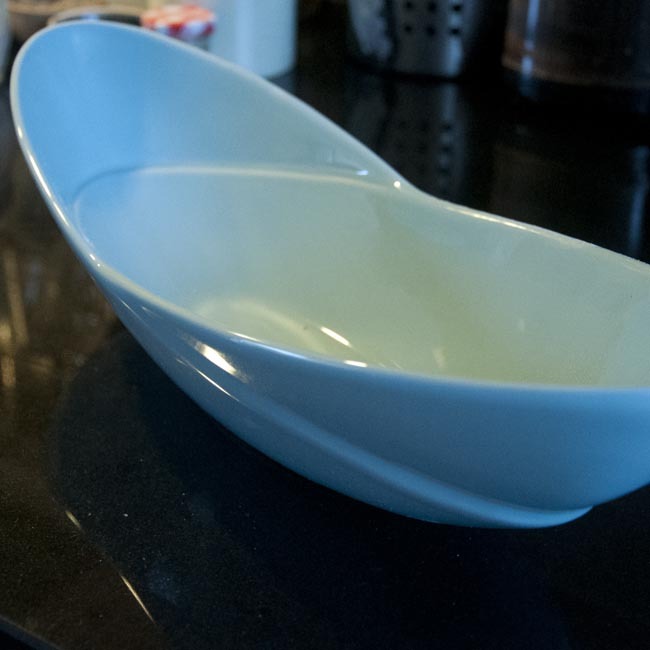 On the salt question – I don’t notice a difference from the further reduction, and it’s likely I’ll reduce the salt again next time I bake a loaf. All in all, this is a great loaf and one I’ll definitely make again in the future! Thank you so much for your kind words! I’m not running a crusade or anything, but the more of these skills I experiment with, the more I realise how much they enrich my table – and my life! I know that sounds trite, but it’s true! I don’t want to live in the past, I just don’t want to lose the great food and skills that have enriched people’s lives for many many years – convenience is not the same as quality! I’d love to accept your award – it’s going to take me a while to get around to doing it though, so apologies for that in advance!